With the DeNOx plant bypassed. Combustion of coal generates considerable quantities of byproducts, some of which are considered pollutants. The byproducts are mostly water vapor which is what we see coming out of a power plant smokestack, carbon dioxide, and nitrogen that is readily available in the air we breathe, and they do not necessarily pose any direct health hazard. However, the emissions do carry small concentrations of pollutants into the atmosphere, which translate into large quantities of hazardous emissions due to the large amount of coal combusted. The main pollutants that can cause health problems are sulfur oxides, nitrogen oxides, particulate matter (see Combustion Analysis) and such trace elements as arsenic, lead and mercury. During the combustion process in a coal-fired power plant, nitrogen from the coal and air is converted into nitric oxide (NO) and nitrogen dioxide (NO2); these nitrogen oxides are commonly known as NOx. NOx emissions contribute to the formation of acid rain. NOx is primarily formed by two mechanisms: thermal NOx and fuel-bound NOx. Thermal NOx formation takes place at high flame temperatures. Formation of thermal NOx increases exponentially with combustion temperature. Fuel-bound NOx formation is dependent upon the nitrogen content of the fuel. The best way to minimize NOx formation is to reduce flame temperature, reduce excess oxygen, and/or to burn low nitrogen-containing fuels. The purpose of the DeNOx plant is for removal of nitrogen oxide from the flue gases. The plant employs a selective catalytic reduction method. The medium used for the reduction is ammonia gas. The DeNOx plant includes two selective catalytic reduction (SCR) reactors and an ash silo. Various dampers channel the flue gases either into or bypass the SCR-reactors. The DeNOx plant is highly automatic, controlled by Programmable Logic Control sequences. The sequences are S701-Purge, S702/703-Start/stop Reactors, S704/705-Heating of Reactors, S706/707-Ammonia Injection, S708/709-Product Handling and S710/711-Soot Blowing. In the simulator, the chemical composition of the coal or other fuels can be specified. The sum of the five components C, H, S, O and N should preferably add up to 100%, to avoid confusion, but it is not strictly necessary because the C, H, S, O and N setting is always recalculated to a 100% basis prior to using in other computations. Water and inert matter (ash/slag) should then be added. The water content varies much and has a great impact on the amount of preheating required by primary air. 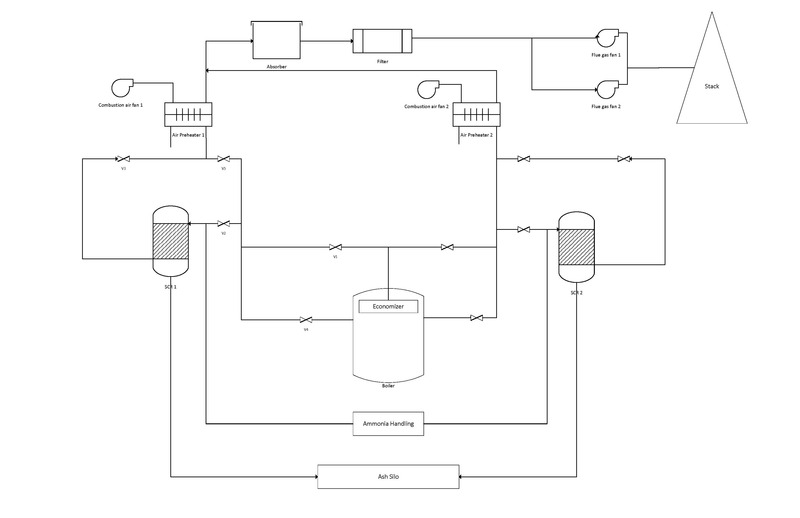 The simulator computes the lower heat value (including water/inert matter) and theoretical combustion air needed and flue gas produced. 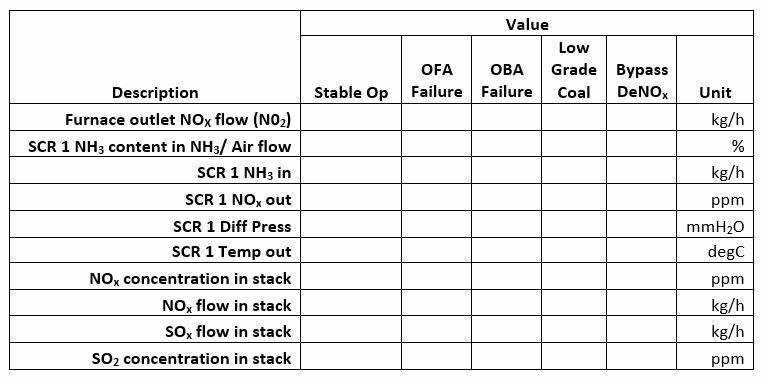 The air/flue gas values are given in ncm/kg (ncm=normal cubic meter). 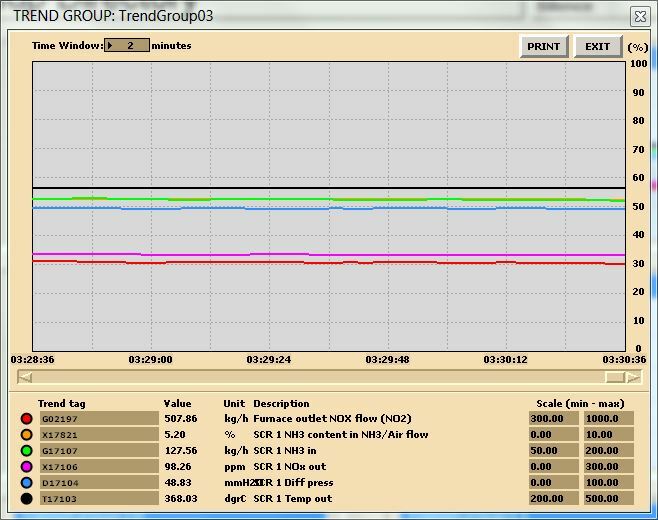 Stable operation: After 5 minutes of running a stable operation, freeze simulator and print the two trends. This is the reference point for the rest of the lab. OFA damper failure: Switch to run mode and activate malfunction 0881 on MD200. After 5 minutes, freeze simulator and print the two trends. Before moving on to the next step deactivate the malfunction. OBA control failure: Switch to run mode and activate malfunction 0780 on MD180. After 5 minutes, freeze simulator and print the two trends. Before moving on to the next step deactivate the malfunction. Burning poor quality fuel: Switch to run mode and access Variable List page 0111 on MD180. Set the new values as shown below. After 5 minutes, freeze simulator and print the two trends. DeNOx plant bypassed: Switch to run mode and bypass the SCR 1 and SCR 2 on MD710 and MD720 respectively. After 5 minutes, freeze simulator and print the two trends. Trend sample 1: DeNOx plant data. 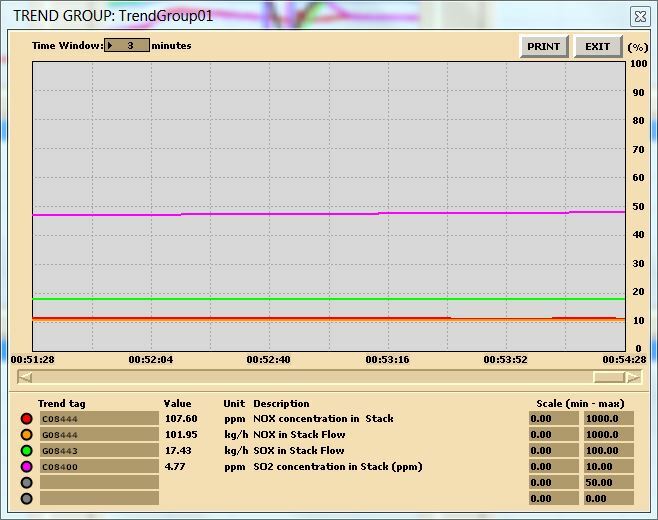 Trend sample 2: NOx stack data. Make sure your trend printouts are labeled properly otherwise, data analysis will be very confusing. 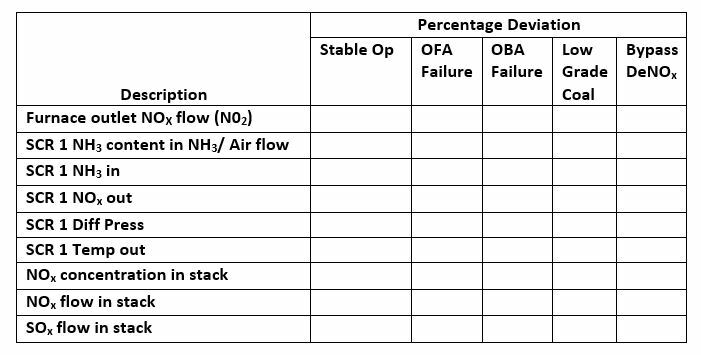 The deNOx plant deviation data. Conclusion: Write a summary (max. 500 words in a text box, if using Excel) comparing your results and suggestions for further study. Emissions of NOx by Serhat Beyenir & Sanja Boskovic is licensed under a Creative Commons Attribution 4.0 International License, except where otherwise noted.